Our global community is made up of all people across the cultural spectrum who have a hunger to succeed and embrace new and innovative ways to achieve this. We’re connecting job seekers across African, European, American and Asian continents who share in our bigger picture which is helping to improve the quality of their lives. By penetrating some of these emerging markets we’re bringing next step mobile technology to job seekers and in so doing leveling the playing field to create job opportunities for everyone. Our Twitter feeds and Facebook fan page allows our job community to engage in topical conversations. We gain valued insight from these shared ideas and ongoing narratives on how we can inspire change. JOBVINE is answering to a brave new world by Revolutionising the recruitment process. We're using innovative technology to streamline and automate the user experience for both job seekers, companies and recruiters alike. We want to inspire a better world through job creation by providing job seekers with click of the button access to unlimited jobs. Seamless technology does the rest. 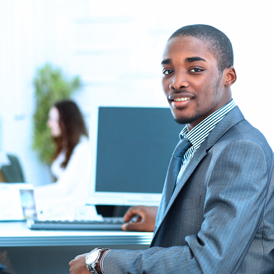 At JOBVINE, we understand that recruiting for different skill sets and experience levels require different approaches. The shotgun approach to job seeking, i.e. the more CV’s you send, the better your chance of landing an interview, does not work. 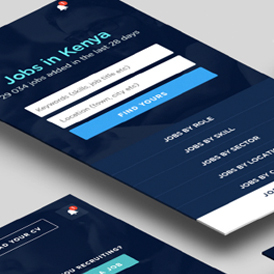 One Platform providing job seekers with click of the button access to unlimited jobs. Seamless technology does the rest. 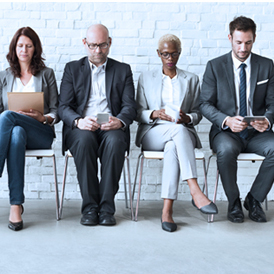 For the jobseeker looking for a career change or challenge, the person who recently lost their job due to corporate downsizing or the recently qualified, finding a job can be quite an intimidating prospect. The universal problem of being the right candidate for the wrong job affects jobseekers globally. 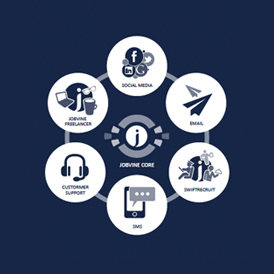 JOBVINE Core is a platform offering tailor designed solutions to this problem, based on skill-matching algorithms that both alerts the job seeker and recruiter of an ideal match. JOBVINE Core provides increased visibility of the latest vacancies by means of aggregation partners, social media channels and email alerts. JOBVINE Core is a responsive browser-based web application that’s built for mobile first, but also equally suitable for desktop and tablet browsing. Improved Job Posting - Low-cost hiring solution, no long-term commitments/contracts, live for 28 days, social media job sharing, priority advert approval for the company. One week access, up to 500 CV’s per day can be downloaded. Intuitive searching for the company/recruiter. Free integration, full API integration both ways, syndication of vacancies from client website, company logo display for the company. Who are we creating solutions for? People who are not afraid to re-write the rules and create a new normal. Today’s semi - skilled worker could be a school leaver with no financial means of attaining a tertiary qualification and tomorrow they could be a successful side business operator who decided to build That door. The below skillsets are interchangeable and our unique platform is designed to facilitate this change, allowing the job seeker to sign up across all three. Someone with a special skill, training, knowledge and (usually acquired) ability in their work. This person may have attended a college, university or technical school or acquired a skill as a result of on the job training. Partly skilled or trained but not sufficiently so as to perform specialised work. Not in possession of a tertiary or further education qualification. A self-employed, independent individual selling work or services by the hour, day and per assignment rather than working for a regular salary for one employer. 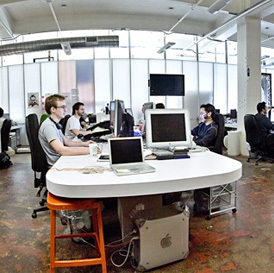 A global transformation of the employment landscape using evolving technology to improve people’s lives. By re-defining the job seeking process, we’re connecting people seeking jobs with the opportunity to build on their dreams. We want to inspire a better world through job creation by providing job seekers with click of the button access to unlimited jobs. Seamless technology does the rest.